Adds color and/or monochrome random noise of given amplitudes to every pixel of the source clip. Unlike the other Grain effects, there is no coherency of the grain between pixels, so the resulting look will vary with different output resolutions. Bw Amplitude: Default: 0, Range: 0 or greater. The amplitude of the black and white static to include. Color Amp: Default: 0.1, Range: 0 or greater. The amplitude of the color static to include. Color Scale: Default rgb: [1 1 1]. Scales the color of the static by this value. 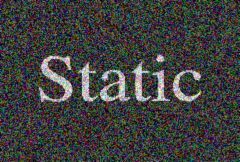 The static will include both positive and negative values of this color.